Choosing construction management software created specifically for property management and construction professionals is crucial. The president of Integrated Business Systems (IBS) points to Acumatica Construction Edition through Imperium Powered by Acumatica as the complete, integrated, and cloud-based ERP system you need and guarantees that it will increase operational efficiency and profitability. 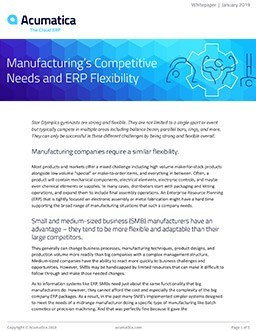 We see plenty of discussion about the advantages of newer, cloud-based enterprise resource planning (ERP) systems and the many reasons companies should ditch their outdated solutions. For those of us at IBS, the ERP system of choice—particularly for property management and construction professionals—is Imperium Powered by Acumatica. So, why Acumatica and Acumatica Construction Edition? You don’t have to look far to find industry insiders touting the pros of Acumatica. As recent winners of two CODIEs and topping G2 Crowd Ratings for User Satisfaction, Acumatica is a solid software-as-a-service (SaaS) ERP platform. Acumatica’s browser-based user experience is excellent, with a feature-rich environment delivered through an intuitive user interface. Based on the platform’s wide-ranging applications, features, and functionality, we decided to partner with Acumatica to develop Imperium Powered by Acumatica. But let’s start at the beginning. IBS launched our legacy property management/accounting software in 1979. At the time, the use of computers in commercial real estate operations was virtually nonexistent. Nearly four decades later, technology has transformed the way the business world operates. Throughout this revolution, IBS continually evolved to meet changing customer needs and commensurate with technological advances. Dozens of regional commercial and residential real estate firms use the IBS legacy system, which is known for its functionality, audit-ability and four-decade development history. Yet in an increasingly mobile and interconnected world, our company leadership recognized that enabling clients to leverage cloud computing as it is meant to be leveraged now—and in the future—would require not just an update but a rebuild. In 2015, we partnered with Acumatica to take IBS forward. We developed a new, custom-designed product specifically to address the needs of commercial real estate and construction management professionals—built on Acumatica’s Cloud xRP Framework. In essence, our two companies distilled the most important functions of the IBS legacy system and redeployed it with Acumatica’s technologically advanced delivery. We launched our Imperium software in 2016, and the product continues to gain popularity as an upgrade option for our existing clients, a technologically advanced solution for new customers, and as an add-on product for Acumatica VARs looking to expand into a new vertical. Why Imperium Powered by Acumatica, specifically? Commercial real estate development and operation carries many moving parts. Development teams, for instance, might have their own set of technology while facility managers use different applications. Information silos can create a multitude of problems for business leaders. While each department might need a different technology stack, integration between these stacks is key. A collaborative, mobile platform solution allows users remote access to familiar dashboards regardless of which devices they’re employing. With more than 40 years in the business, we had the unique combination of technology know-how, market knowledge and experience to help create an industry-specific niche solution for property management, accounting and construction management operations. In short, Imperium is designed to help clients increase operational efficiency and improve the bottom line with a fully integrated property management/accounting system. The construction accounting software and construction ERP also integrates with third-party products across multiple real estate services categories, including popular tenant screening, residential portal and utility billing applications. Imperium is scalable and customizable for enterprises of any size. It is, arguably, the most robust, enterprise-wide product of its kind and will improve customer satisfaction immeasurably. With a customer-centric approach and a best-of-breed integration model, we serve our clients not just as a cloud-based ERP solutions provider but as an invaluable resource and partner. If you’re interested in learning more, visit us at ibsre.com or message me at mmullin@ibsre.com. Michael Mullin is an experienced top and bottom line business leader who is a catalyst for formulating new and improved product and market strategies. He possesses knowledge of software development and support with a strong understanding of the database/enterprise applications market. He has a successful track record in managing fast-growth enterprises, setting organization-wide goals and objectives, and meeting those targets in a timely manner. We went from 10 users in our old system to 70 users now, and we don't have to worry about if somebody is only going to be in the system for 15 minutes a day. We can get them access to Acumatica at no additional cost, so they can enter the work in real time. Manufacturers and distributors: Get Gartner’s enhanced strategic guidance for 2018.